My elective was split between Ghana and Nepal; I chose to spend the start of my elective doing clinical medicine in Ghana and then the end of it getting lost in the Himalayas. So how did I come to choose, what I think, were the best 10 weeks of my life? I did my BSc in Global Health, and my dissertation on malaria, and so read about all of these wonderful places in sub-Saharan Africa, without having visited a single one of them. After hours of research (or procrastinating), I read that Ghana was not only English speaking, but was seen as the “gateway to Africa” and perfect for first timers to the continent. Coupled with the fact that I wanted to do obstetrics & gynaecology and that women here were fairly accepting towards being examined by male doctors, I decided that I wanted to carry out the medical part of my elective in Ghana. 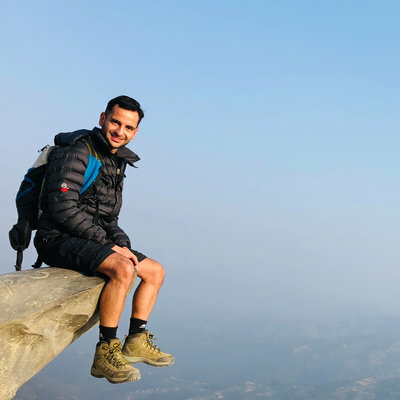 Additionally, since I was a child, I had dreamt of trekking in the Himalayas, so when I found a trek that departed three weeks before the end of the elective period, I knew that I had found my dream trip. Unsurprisingly, there weren’t many people that had the same aims and goals from their elective as I did. I therefore decided that if I were to go solo, I’d rather do the medical part somewhere that was not only well recommended but also allowed me to meet other elective students. I therefore decided to do my elective through Work the World (WTW). From the word go, they were fantastic in organising everything for me, from the airport transfers to the hospital attachments as well as the accommodation & food. The WTW house is located in Takoradi, on the southern coast of Ghana. It houses elective students from all over the world. When I was there I came across mental health nursing students from the UK and student nurses from Canada, the USA and the UK. It was great to be able to talk to one another after a tough day. It was relieving to know we were all in the same boat as each other, seeing many different things for the first time. Much like the system here, the first step of being a junior doctor is to be a “houseman”. Housemanship in Ghana lasts for 2 years; 6 months each on paediatrics, O&G, medicine (including A&E) and surgery. After your housemanship, you would then have to pass an entry exam into the specialty you wish to pursue. At this point you become a resident, which lasts for 4 years. 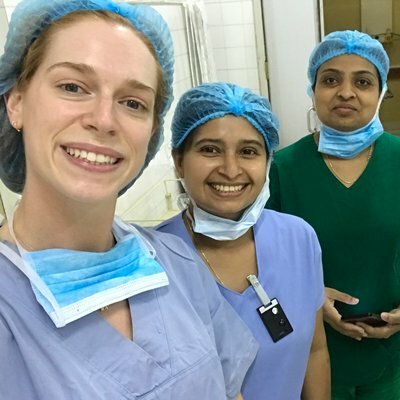 Only after you have completed your residency, can you apply for the role of a specialist (equivalent to consultant) within the hospital.For my clinical attachment, I was based at the largest hospital in the whole of the Western Region; obstetrics & gynaecology have a whole building to themselves. Ground floor houses the labour ward, antenatal ward and two operating theatres. As soon as a pregnant woman is in established labour, she is moved from the antenatal to the labour ward. On the first floor is neonatal care with the post-natal ward. Then on the second floor is the combined obstetrics & gynaecology ward, where women with gynaecological complaints or early pregnancy issues are admitted. Every morning at 8.30am (in Ghanaian time this could mean 10am!) the four house officers, resident and one specialist would convene in the meeting room. Each house officer takes it in turn to be first on call for the whole department for 24 hours. At the morning meeting, the exiting houseman would go through all of the admitted cases over the last 24 hours with the rest of the team. Not only is this used to inform the team of the new cases, it is also used as a learning tool, for the houseman to answer questions on why they made the decisions they did. After the meeting, the team would disperse to either being on-call/on labour ward/theatre, on the obstetrics & gynaecology ward or in the antenatal clinic. Every Thursday morning, the specialists would hold a teaching session based on the joint LSTM-RCOG manual, “Life Saving Skills – Essential Obstetric Care and Newborn Care” to the juniors and midwives. Topics covered whilst I was there included pre-eclampsia and post-partum haemorrhage, two of the major causes of maternal mortality. These sessions would start with a lecture and be followed by small group tutorials, delivered by each of the four specialists. It was interesting to see how it was delivered at a level that met the demands of both doctors and midwives. The tutorials were well delivered and very interactive and did a great job of emphasising the pertinent points made in the initial lecture. My first day at the hospital was one I will never forget. There was a woman found lying on the floor of the labour ward. She was 31 weeks pregnant and had 5 successful previous pregnancies, with the last one being her only Caesarean section. She suffered from maternal diabetes, resulting in failure of the foetus to achieve its growth potential and an abnormally large volume of amniotic fluid. She was rushed into theatre for an emergency Caesarean section. It became immediately apparent that on incision, there was blood in the abdominal cavity secondary to uterine rupture. After removing the, now dead, foetus, the mother had lost more than two litres of blood, and went into shock. Without hesitation, the lead surgeon mounted the table, climbing on top of the woman to use his body weight to effectively deliver CPR. Unfortunately, he was unable to get the mother back into sinus rhythm, at which point she was pronounced dead. The assisting surgeon turned to me "Have you ever seen a maternal mortality before?" to which I shook my head, unable to verbalise anything after witnessing my first maternal death. "Welcome to Africa", she replied, "I'm sure this won't be your last". I spent most of my placement shadowing and assisting the housemen, dividing my time between the labour ward, theatre, antenatal clinic and on-call. The housemen effectively ran the show. The transition between medical school and housemanship in Ghana is vast. Especially for the many who graduate from medical schools in Eastern Europe (due to the limited places in Ghanaian medical schools). Many felt unsupported, overworked and exhausted. I could not imagine straight out of medical school, having to be first on call for a regional centre. To then have to do this 1 in 4 days is not only incredibly demanding but also extremely arduous, especially when you have to do this for 6 months. Unfortunately, it is the only option. Doctors are scarce in Ghana; where in the UK we have close to 3 doctors per 1000 people, in Ghana there is only one-tenth of a doctor to the same population. Because doctors are so poorly paid and/or paid so irregularly (one doctor had not been paid in 8 months), as soon as one becomes a specialist, the majority of one’s time is spent in private practice. There is therefore great reluctance to call seniors, and juniors are expected to do a lot more than their counterparts in the developed world. However, I can imagine it is also a great experience. By the end of the rotation, I found one houseman who showed me a log book that would rival a core trainee in O&G. My favourite times in the hospital were when I was on-call. It was always in the middle of the night when I would see the weird and wonderful presentations. Presentations in Ghana are much later than you would see back home due to the multiple barriers to healthcare; infrastructure is inadequate, the number of health facilities is limited, and due to poor education, people leave their complaint until the last minute before arriving at hospital etc. Cases included incomplete miscarriages, unsafe abortions, sepsis, many cases of obstructed labour and pre-eclampsia. Having originally wanted to do all my time in O&G, I decided it would be better for my clinical experience to see a greater variety of cases. With this in mind, I organised to do more A&E shifts towards the end of my placement in conjunction with O&G. The A&E department, as in the following picture, was far from what one would expect a tertiary centre to look like. Staffed by one sister, one doctor and an array of 3rd year nursing students, many of my shifts looked akin to a war zone. It is here that I was able to have the most experience. I would clerk, write up, manage and review every patient I could, with assistance from the doctor. Cases included malaria, elephantiasis, trauma, intestinal obstruction, tuberculosis and sickle cell anaemia. In the majority of cases, because once stabilised, the patients are transferred to the relevant department, it was difficult to know whether the diagnosis I had in mind was right, or whether my management plan was what the team actually followed. It did give me fantastic experience of managing the critically ill patient, and confidence in practising what we were taught at medical school in real life. I found the transition into the hospital to be incredibly difficult. I felt deskilled. 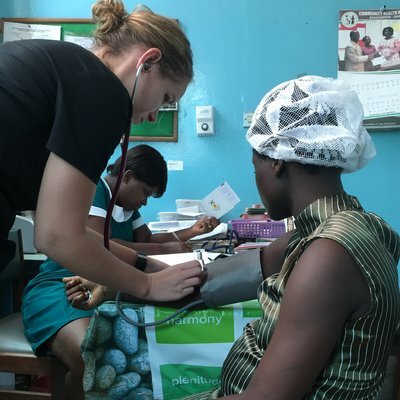 The vast array of blood tests, modes of imaging and management options that were at my fingertips in the UK were almost non-existent in Ghana. Blood results were questioned, culture sensitivities to different pathogens would often be wrong and X-rays were never done. Attitudes of staff towards me would vary somewhat. Some were very friendly and welcoming while others would laugh at how in the UK they perceived that machines did everything for us. It was very difficult, but I made sure not to be that elective student who comes over to the hospital and talks about how “in my country we do this” because I’m sure they’ve heard it time and time again. There is very little published literature on maternal mortality in Ghana. The Ghanaian government was set an aim by the WHO to reach a target of 185 maternal deaths per 100,000 live births by 2015 with regards to the Millennium Development Goals that were set in 2000. In 1990 it was 760 and in 2013 it was stated to be 380. I wanted to look into the performance indicators of maternal health with regards to the hospital I was working at in Takoradi. After weeks and weeks of delayed meetings, running up and down the district to seek permission from various public health officials, and having scrutinised every discrepancy in data I managed to get some interesting results. With regards to the hospital, the maternal mortality ratio has indeed been declining, but it is higher than what the UN have stated. In 2013, initial calculations have found the MMR to be almost 120 higher, at 442 maternal deaths per 100,000 live births. The results are still being processed but the preliminary findings are exciting to say the least. My final week of medicine was spent in a rural village healthcare setting. Together with a student child nurse, we were sent to a village, 2 hours drive east from Takoradi, also on the coast. With no running water or electricity, the residents all live below the poverty line. Sleeping on mattresses with no fan in high 30 degree heat was far from the comfort of city life in Ghana, however, after a few days, we got used to it. The nurse that ran the clinic was on call 7 days a week, 24 hours a day. He was the local GP, nurse, child nurse and pharmacist. He did absolutely everything and I had the utmost respect for him. He was a local hero, and he essentially looked after the whole village. With a two hour drive to the local hospital, he was the villagers only point of care. It is great having big tertiary hospitals like the one I was placed in, however, the majority of people cannot access these facilities. It is in this setting where these clinics have a huge impact on the healthcare of those who are too poor to even afford transport out of their villages. Before embarking on my elective, having been interested in maternal and reproductive health since carrying out my BSc, I decided to climb to Everest Base Camp for a charity called Ammalife. Ammalife is a small charity founded in Birmingham that I came across at a Global Women’s Health conference last year. It is run by a group of volunteers, seeking to improve maternal health on a global scale through small projects in Malawi and Pakistan. The trek itself was truly spectacular and it was not short of any setbacks by any means; our main guide was evacuated via helicopter after stress fractures to his spine, I felt light headed and collapsed at 3750m, one of the travellers had an asthma attack (which I managed at 4000m high, armed with an inhaler) and many of us suffered from heatstroke due to the glare from the snow! The only way in and out of the trek is to fly to Lukla airport at the base of the Himalayas, which houses one of the most dangerous runways in the world. Due to poor weather conditions at the end of the trek, we ended up stranded in the Himalayas for a few more days than expected, such that the only way out was to charter a helicopter to take us back to Kathmandu. All in all, I met some wonderful people (two of whom got engaged at base camp), pushed myself to my physical limit and saw some of the most beautiful scenery the world has to offer. Oh, and I also managed to raise nearly £1000 for a charity I am incredibly passionate about. All in all I had a wonderful elective and which would not have been possible without funding from the Enid Linder Foundation, the Cambrian Society and the Wellbeing of Women. So thank you to each and every one of you.